When the first students walk into classes at the new San Carlos Apache College on Monday, they’ll not only be learning biology and accounting, they’ll be part of a mission to preserve their language and culture and drive economic prosperity in their community. Arizona’s third tribal college opened Friday on the San Carlos Apache Reservation after two and a half years of intense planning and preparation, much of it done with the assistance of Arizona State University. More than five years ago, the chairman of the San Carlos Apache Tribe, Terry Rambler, had a vision to create a college, and he asked ASU President Michael Crow for help. The Apaches were able to leverage the expertise of Maria Hesse, vice provost for academic partnerships at ASU, and Jacob Moore, the university’s assistant vice president for tribal relations. At Friday’s ribbon-cutting ceremony, Rambler said that San Carlos Apache College is for everyone in the community — high school students, tribal employees and elders. “This is the beginning of something great. This is a way to say no to alcohol and drugs by using our minds in a good way and not abusing them,” he said. Hesse is the former president of Chandler-Gilbert Community College, and was on the team that founded the college in the late 1980s. So she was able to offer insight to the community members on how to create an institution from scratch, working with the tribe to have a long-term plan in place to ensure they would open on time. “If you want to start classes in August, here’s what you need to do in July,” she said. “What are the priority hires? If you want to do electrical wiring in July, you need to rip everything out by June. We talked about the program of study and class schedule. Classes will be held in a stone building in downtown San Carlos that was the previous tribal administrative headquarters. Workers were still renovating the building into classrooms during the ceremony on Friday and expected to work straight through the weekend until the start of classes Monday morning. At first, the college will offer general-education courses in English, math, biology, chemistry, accounting and computer literacy. Eventually, the curriculum will be expanded and associate’s degrees will be offered. Tuition will be $34.50 per credit hour, so a full-time semester of 12 credits would cost $414. For now, San Carlos is offering classes as a site of Tohono O’odham Community College, a tribal college in Sells. That allows San Carlos to be accredited until it earns its accreditation independently in about four years. Accreditation is critically important because it allows students to qualify for financial aid and for their credits to transfer to universities. Like at all Arizona two-year colleges, students at San Carlos will be able to map out their majors to efficiently transfer to ASU. The college will have core values based on the Apache concept of Go’zhoo — to be at peace. Tohono O’odham Community College is a good blueprint for how tribal culture is integral to the vision. All students take two classes in “Himdag” — the lifelong elements of culture, values, language and way of life for the tribe. The college has a committee made up of staff, faculty, students and community members that works to incorporate “Himdag” into every aspect of college life. “They don’t teach anything that’s out of sync with their culture,” said Moore, who is a member of the Tohono O’odham tribe. Martin Ahumada, the new president of San Carlos Apache College, said that preserving culture is vital for the Apaches. “It has been known for many decades that the knowledge of one’s native tongue and being well grounded in your cultural traditions is important for self-esteem,” said Ahumada, the former interim president of Dine College on the Navajo reservation, the country’s first tribal college, founded in 1968. Among the San Carlos Apache, few members younger than 35 know the language, according to Cordella Moses, a curriculum specialist for the tribe’s language-preservation department. She helped to design the Apache Language and Culture course, which is offered at 5 p.m. every Monday and Wednesday this semester. “A lot of people think ‘culture’ refers to ceremonial dancing, but culture means a lot more than that. It’s our art, how we make moccasins and beadwork, and our meditation and our prayers,” she said. Ahumada said that besides Apache culture and the general-education courses, he would like to prepare students for jobs in San Carlos, which has a casino and a new medical center. “We want courses in health sciences, natural resources. We’re going to explore cybersecurity and entrepreneurship,” he said. The college received a $1.5 million federal grant in 2014 to get started, and the tribal council recently agreed to fund it with $2.5 million. ASU’s support for the tribal college is part of a larger agreement between the university and the community, signed in 2013, that will include design and construction assistance when the San Carlos Apache are ready to build a campus; college-readiness and healthy-lifestyle programming for young people; and academic counseling and personal support for San Carlos freshmen and transfer students through the Native American Achievement Program at ASU. Hesse said that Crow agreed with Rambler’s idea of jump-starting the tribe’s business community with the college. “He felt like they were like-minded in their shared belief that education brings opportunity and hope to our youth while fueling economic development,” she said at the opening ceremony Friday. A sign for the new San Carlos Apache College replaced the former San Carlos Apache Tribal Hall in San Carlos, Arizona. ASU and Tohono O'odham Community College worked closely with members of the San Carlos tribe to establish the community college. The incoming freshmen will be offered general education, as well as Apache language and culture courses. The former Apache Tribal Council hall is the new home of the San Carlos Apache College. Workers face tight deadlines to finish the renovation of the former Tribal Council Hall so classes can begin on time. The former San Carlos Tribal Council room is filled with new furniture and will soon become a lecture hall. Tribal burden baskets sit astride the lectern before the grand opening of the new San Carlos Apache College on Friday. New human resources specialist Deidre Antonio (center) sings the national anthem in the Apache language as Pastor Fernando Pechuli Sr. (left) and tribal Chairman Terry Rambler stand at attention at the start of the grand-opening celebration. More than 100 tribal members and supporters celebrate the grand opening. Board of Regents members, supporters, Tohono O'odham Community College President Paul Robertson and San Carlos Apache College's Martin Ahumada celebrate the ribbon cutting. San Carlos is about 110 miles east of Phoenix, yet its economy is underdeveloped. With nearly 60 percent of the population under the poverty level, it is one of the poorest Native American communities in the U.S. The opening of San Carlos Apache College will provide post-secondary education and skills for members and the community to have higher standards of living. Graduates from the San Carlos High School will have the opportunity to continue their education at the new San Carlos Apache College. The future freshmen will be able to take general education and natural resources classes, as well as study the Apache language and culture. Like many reservations, San Carlos faces poverty, unemployment and other socioeconomic challenges, Moore said. Abi Graves’ involvement at Arizona State University changed when she joined the Green Devil Network. The network brings ASU faculty and staff together to develop and lead a sustainable university culture. Members receive invitations to exclusive behind-the-scenes tours, events and workshops with eco-minded faculty and staff. 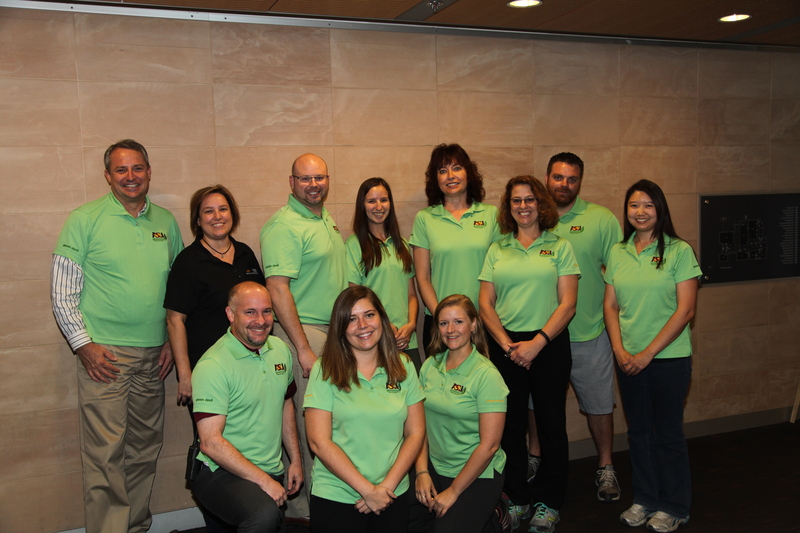 First year Green Devils network with ASU staff, attend sustainability sessions and complete a toolkit. The toolkit includes instructions on creating a culture of sustainability, waste and carbon reduction and water conservation. In the second year, Distinguished Green Devils lead a project to improve their area, department and wider ASU community. To learn more about the network and speak to other Green Devils, attend a recruitment event on the Downtown Phoenix, Polytechnic, Tempe and West campuses. Participants can attend monthly workshops on the Tempe campus and quarterly events on other campuses. Speakers from ASU departments highlight sustainability practices and goals at ASU. The network also discusses solutions to workplace sustainability challenges. Join the Green Devil Network by Sept. 30 to be featured attendee at the State of Sustainability at ASU event. For more information, email University Sustainability Practices.